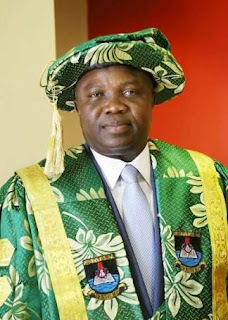 The Governor of Lagos State and Visitor to the Lagos State University, His Excellency, Mr Akinwunmi Ambode, to Grace LASU 22nd Convocation Lecture this Tuesday, 22nd May, 2018. The Governor of Lagos State and Visitor to the Lagos State University, His Excellency, Mr Akinwunmi Ambode, will be in the University for the 22nd Convocation Lecture this Tuesday, 22nd May, 2018. The Governor will join the Chairman of the occasion, Nigeria's Former President, Chief (Dr.) Olusegun Obasanjo, GCFR, at the Lecture. The Convocation Lecture, titled "Role of Tertiary Education in Promoting Social Cohesion and Peace: Opportunities and Challenges for Nigeria" will be delivered by the Executive Secretary, National Universities Commission (NUC), Prof. Abubakar Adamu Rasheed, mni, MFR, FNAL. Venue is the University Auditorium Complex, Main Campus, Ojo, and time is 11am. All members of the University Community are invited, and are to be seated by 10am. Furthermore, all the other programmes of the 22nd Convocation Ceremonies will hold as scheduled (see LASU 22nd Convocation Ceremony Date & Programme of Events – 2018) and all Stakeholders are encouraged to be part of the programmes. Also follow discussions on Twitter via: #Lasu22nd Convocation and follow the handle: @LASUOfficial. Members of Staff, Students and the University Community are cordially invited to attend all the programme.